On the way to find our realtor for our tour today, we met his neighbor, Antonio. He is retired and from California but they have been back and forth several times before he finally built his dream house here in Panama. Quite the place! He keeps two large dogs that speak only Spanish, to keep the animals away from the property. Apparently it works pretty well, it almost kept me away! I told him about our internet problem and he invited us in to use his, which we did. So, just where are we? 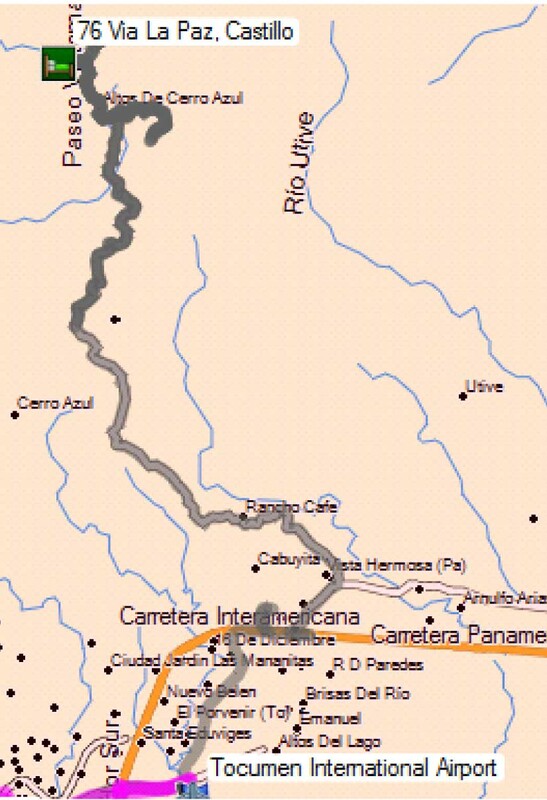 If you look at the map, you will see Tocumen Airport at the bottom and 76 Via La Paz Castillo at the top. That is where we are. After we did our Internet business, we went next door to meet Paul, the brother of the person we are renting from. Both are Canadian and have been in real estate in this area for about 15 years. This is a single development here of 2800 lots, 500 of which are sold. Paul says that their slump, due to the economy, was in 2009 and it got better in 2010. 2011 was their best year so far. Their inventory of resale homes is depleted due to the interest here. There is no MLS here so an agent will try to sell you their own properties. Depending on what you want, there are lots of cozy smaller places that you could buy for under $100K. Construction prices run from around $50 to $100 per sq. ft. depending on how elaborate you want your home and they have access to an English speaking builder (Paul’s son). They sell a lot of lots. Lots here go from around $20K up to $70K for the more desirable properties being those that have the best views, the most privacy, the best topography (meaning enough level ground to build a house on), and size. 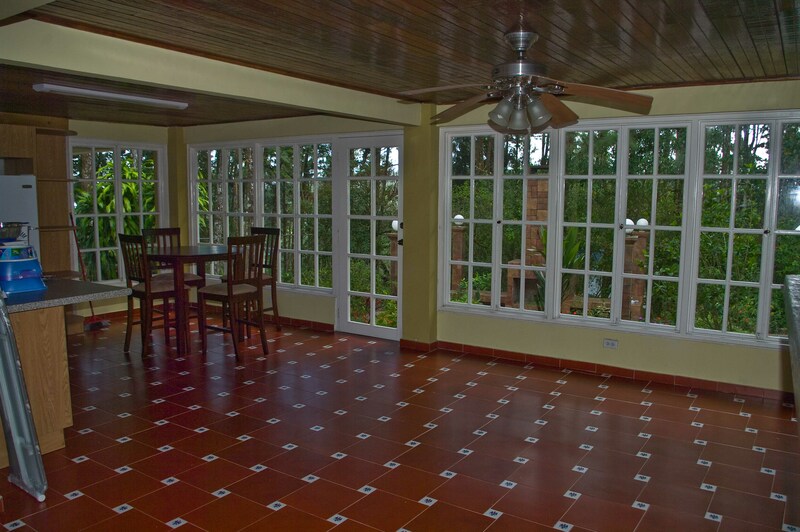 Generally, the Panamanians buy in the $20K range with foreigners buying the better property. We saw several lots and it becomes easier to guess the price based on knowing the criteria. We found one that was of particular interest to us. It was a large lot in the 1800 Sq. M range on a ridge with views in both directions and right at the end of the road. Traffic or privacy would not be a problem. On the next lot was a derelict house that Paul has researched in detail. He wanted to find the owner and offer to buy it from him. The house was owned by an old Panamanian woman who died but had one son, which nobody can seem to find. The house has not been visited for years. Paul tells us that if it was him, he would build on the empty lot in such a way as there was no windows on the back to see the derelict house. Next he would cut the out of control jungle and paint the front of the old house. If nothing happens for 15 years, you can then claim the property under squatters rights and the government will give it to you. 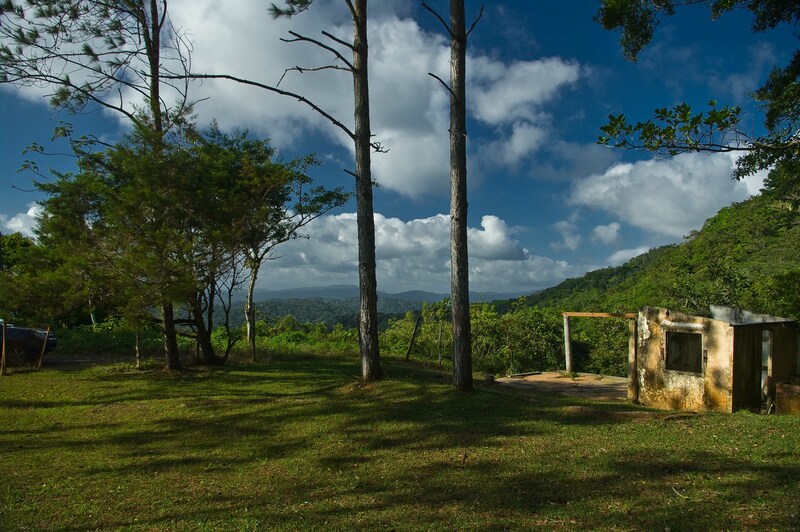 We didn’t know that Panama had squatters rights in place but apparently it does and if it takes 15 years for a piece of abandoned property to be claimed, it seems much more reasonable than Costa Rica’s relatively short timeline. 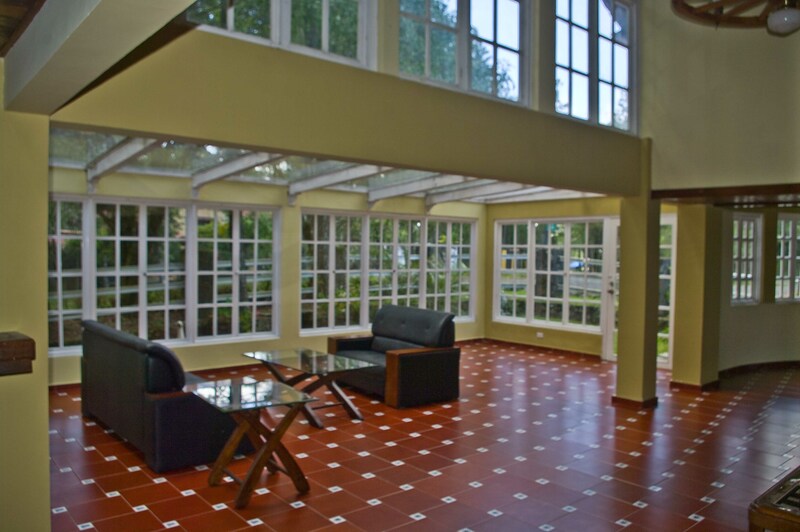 It seems that this place is experiencing a renewed interest and no wonder because there are only a limited number of lots and they are located in a national park. The area is popular for Canadians and Americans and is just starting to catch on with the European crowd. We did see one house. It is a big sucker, coming in around 3,000 Sq. Ft. 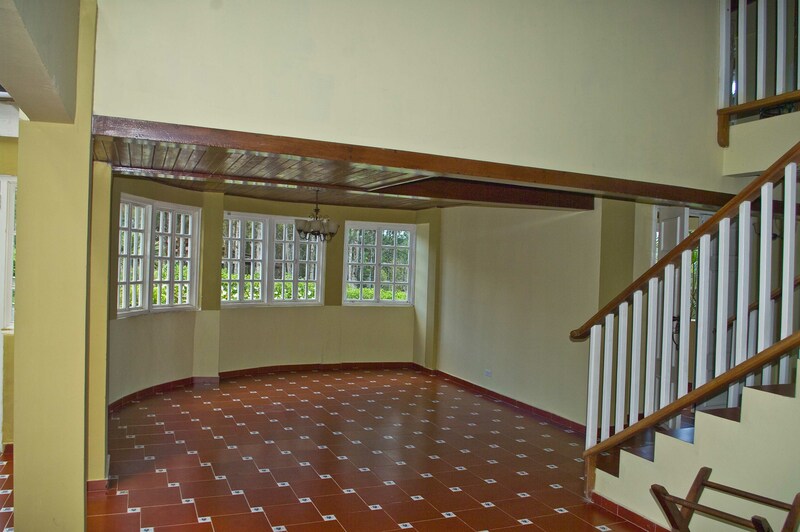 It was built 20 years ago by a well to do Panamanian jeweler before he became interested in commodities which eventually lost him this house, the jewelry business and his house in the city. The house is now empty and has been so for about two years. It is a striking house from the exterior due to the vast amount of glass. Here of some shots of the massive main floor. 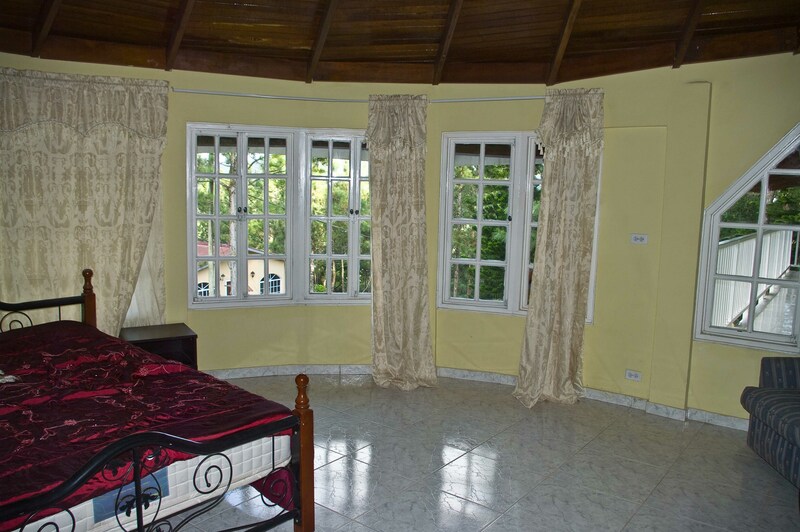 Bedrooms and bathrooms are all king sized and there is a third floor with a loft suite. The attic is also a good size. When you look at the workmanship here, it strikes me that this would be hard to get today. Large hardwood beams supporting the roof are open to the house and the intricacy of the beam arrangement over the large turret is interesting. I just realized that I missed getting a shot of the outside of this place so will have to catch it up in the next day or two. The house is listed for $308K but Paul tells us the owners would accept $275K. He says that if someone wanted to turn the main floor into a steak and lobster restaurant, only open on weekends, that it would be a license to print money because the closest such place is all the way across town in Panama City. All we need is a chef!!! 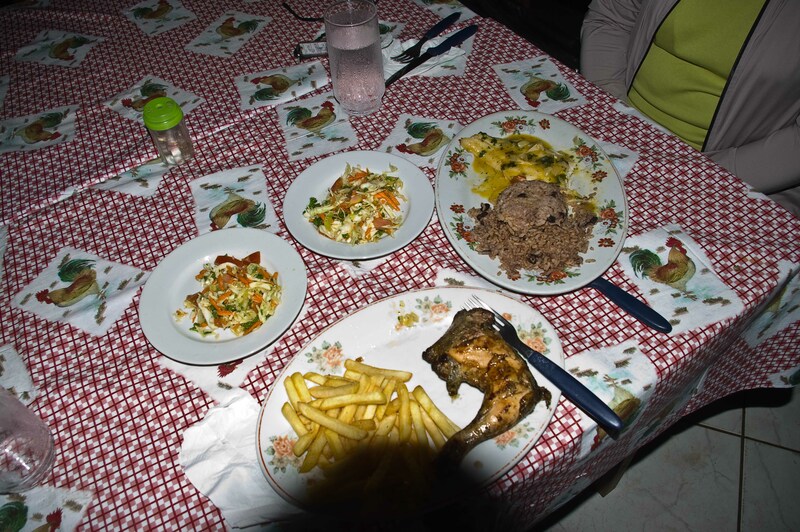 Living costs here in Cerro Azul are relatively small. You don’t need air conditioning or heating so electricity is not much. Antonio tells us he pays around $30 per month for electricity. Water is $10 to $15 per month. DSL Internet service is $16 per month with your phone. Gas depends on use. Everything here runs on propane. You can get the big tanks (hundred pounders) that have to be swapped out by a truck or you can have a few 25 pounders and look after the filling yourself when you go into town. Antonio says he uses about three per month for him and his wife and because the government subsidizes the 25 pounders, they only cost $4.50 per fill. He says that the hundred pounders are expensive. Oh and then the equivalent of a condo fee that every lot pays. 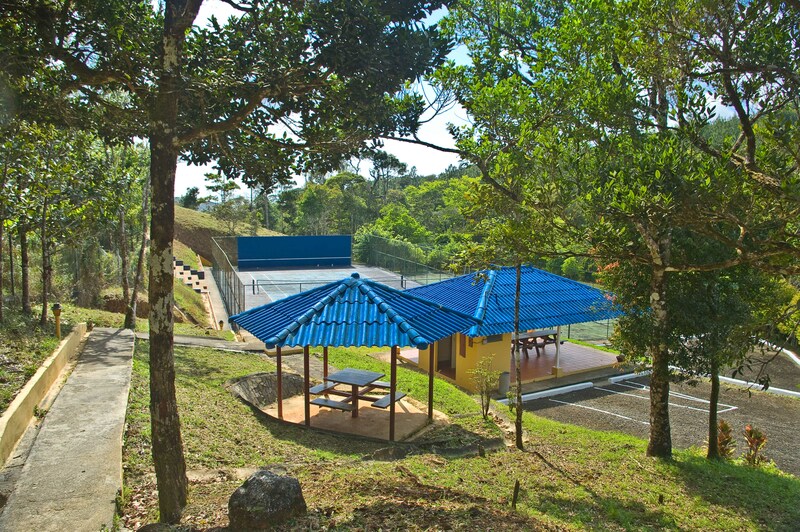 It covers the maintenance of the pool, tennis courts, and restaurant complex as well as trail maintenance, road repair and debris cleanup when needed. For all that you pay $27 per month. A handyman will cost you $25 per day. I wanted to check out the pool, so we piled into our trusty Toyota and drove down to the pool complex. It takes about 15 minutes. 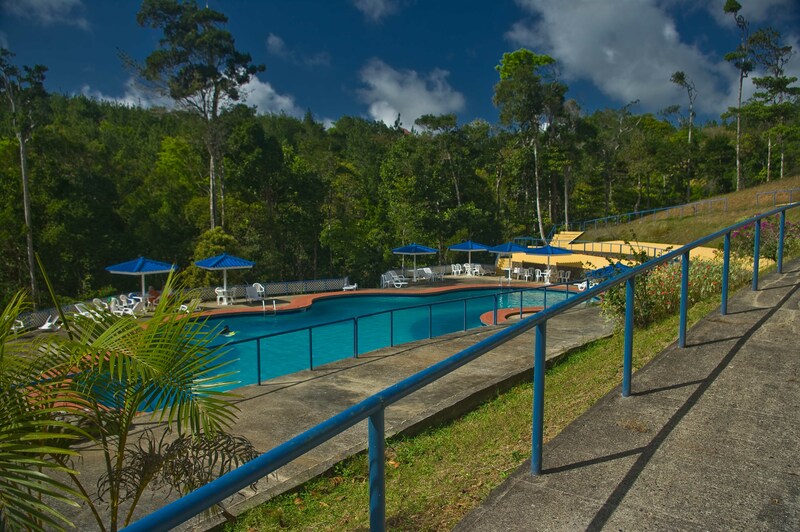 The area is beautifully kept and includes the pool, tennis courts, the restaurant building and several little picnic areas carved out of the hillside, each with its own bright little blue roof. 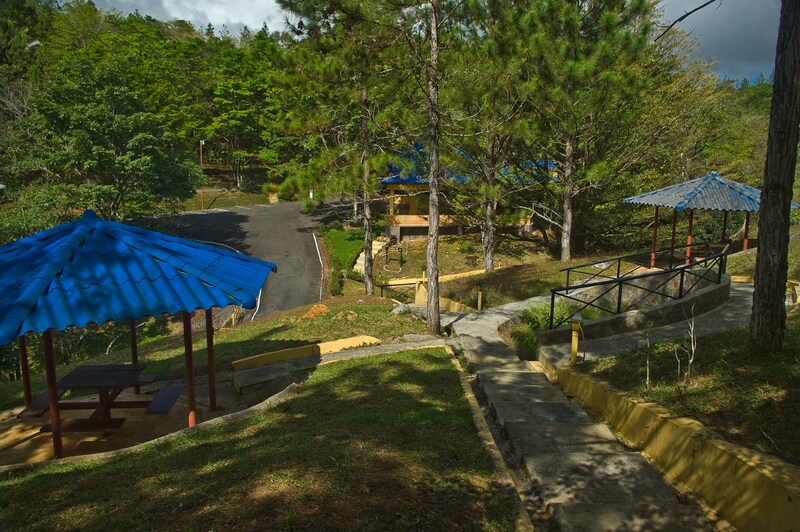 The area has lots of concrete walkways to get you from one place to another. The gigantic pool was actually quite cool, compared to the one at our last hotel, but very clean and very refreshing. As you can see, there are no people here. It only gets a bit busy on weekends. Well after all that, we needed dinner. 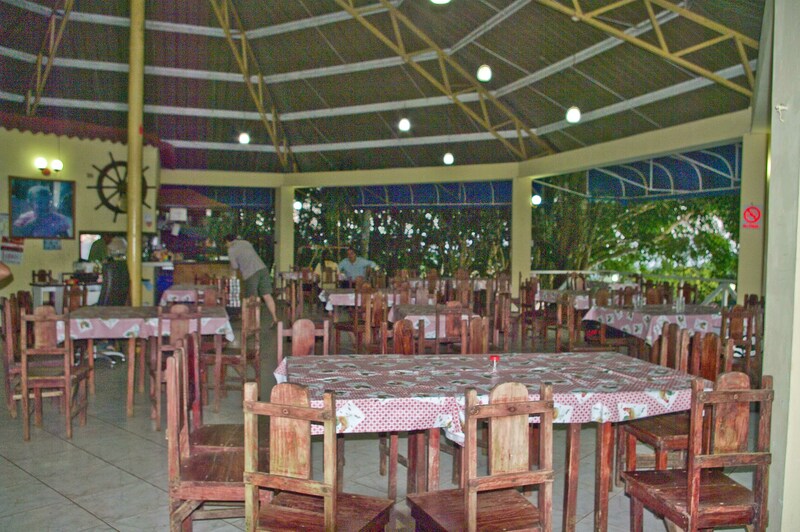 We had decided earlier to try a restaurant outside the gate about 6.5 Km from here. Due to the winding road, it takes about 25 minutes to drive there. 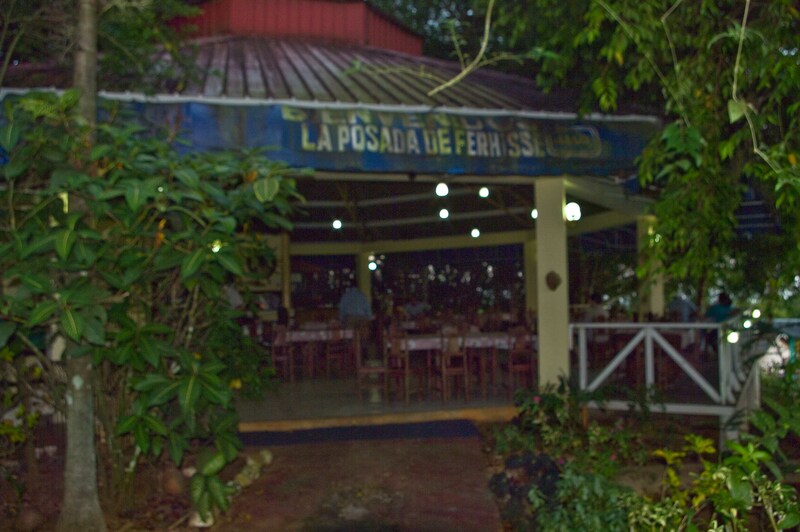 It is called La Posada De Ferhisse and is definitely Panamanian. We were pleasantly surprised when we walked in to be given menus with both Spanish and English so we could point out our selections to the wait person who seemed to speak only Spanish. We ordered roast chicken and fish of the day. Along with salads and a couple of soft drinks, the total came to a whopping $12. Oh, and by the way, the food was really good! We would give this place a double thumbs up! Tomorrow, we have plans to head into the jungle! I’ll tell you about it then (if we make it back) .